It was predictable that when San Francisco 49ers QB Colin Kaepernick refused to stand for the National Anthem before a preseason game last week a firestorm would erupt. Kaepernick a few years ago was regarded as a rising star in the NFL, but last season ended up losing his starting position as San Francisco faded badly down the stretch and missed the playoffs. Thus far he has mostly been hurt this preseason, and now he’s also squarely in the midst of a huge controversy that has plenty of right-wing types and even some NFL players and pundits upset because of his actions. Kaepernick is already on record saying he expected that kind of reaction, but isn’t going to let fear of a backlash have any impact on his protest, or his reasons for doing it. Kaepernick said he didn’t stand during the national anthem as a protest against the civil unrest across the country. 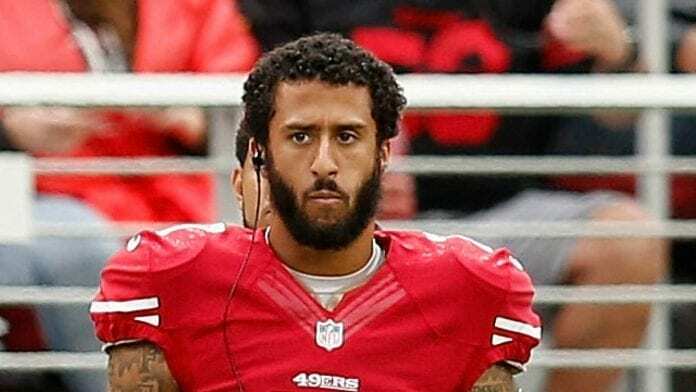 “I am not going to stand up to show pride in a flag for a country that oppresses black people and people of color,” he told NFL Network’s Steve Wyche after the 49ers game against the Green Bay Packers. The San Francisco response tried to walk the fine line between validating his right to protest and their desire not to alienate more conservative types. Incidentally, there is NO rule requiring NFL players to stand at attention for the anthem. The league said that they would like players to stand, but have never demanded that they do. So contrary to what some have claimed, Kaepernick is not violating any NFL rules with his action. In taking a bold and lonely stance, Kaepernick may also be ending his tenure with the team. However it would cost them $12 million against the cap to cut him now, so chances are very good that Colin Kaepernick will remain a 49er for at least another season, no matter how angry or upset some are with his decision. He also says he’s going to keep doing it, which means this will continue to be an NFL hot potato for weeks to come.